Late last night, I Googled "bulimia." A very good friend called me extremely upset and told me he heard his daughter throwing up after dinner. He is worried but doesn't know what to do. She is 12 years old. I don't know much about this topic, but I knew enough to search for "bulimia." But then I thought to myself, "If you grow up living with domestic violence, what would you search? What if you're 12 years old? What would you look up?" What happens when you don't know what to search? The Adverse Childhood Experiences (ACE) Study examined the 10 major childhood adversities and documented the impact they can have on a life. Most of these adversities are well known by name, making it easier for anyone to search for them and find information. Most people have heard of physical child abuse, sexual or emotional abuse, losing a parent or caregiver to incarceration or divorce, and substance abuse in the home. But one childhood adversity has practically no awareness at all -- Childhood Domestic Violence (CDV) -- which is when a person grows up in a home living with domestic violence. From a childhood standpoint, domestic violence is violence between your parents or violence towards a parent -- perhaps from a stepparent or significant other. 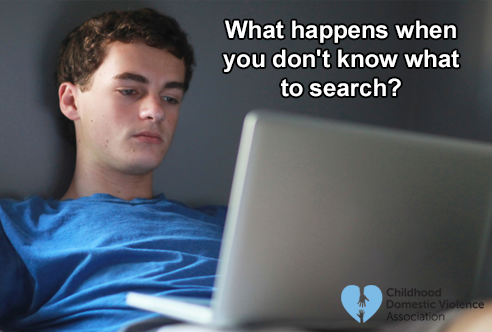 In a previous blog post, I shared data that showed, even during a peak week, when there were 250,000 searches for "domestic violence," only 51 searches also included the words "child," "children," or "childhood." While people may be aware of domestic violence, there is still very little awareness of the impact growing up with it has on a life. No one knows to search for it. This is partly because most don't even know what to call it. This particular childhood adversity has never before had a name. And by not having a name for it, a person can't know what to search and find the information to understand and learn about the impact or the resources available that could help. Those who grow up living with domestic violence need to be able to name it before they can address it. Roger "Rock" Lockridge shared his story of growing up with childhood domestic violence in my book INVINCIBLE: The 10 Lies You Learn Growing Up with Domestic Violence, and the Truths to Set You Free. A critical step for him to begin overcoming the impact was realizing that there was a name for the adversity he grew up with. He recounts how having that name changed his life by setting him on his journey towards discovering the TRUTHS that counter the LIES he learned growing up. According to Roger, "The fact that there was a name ... I had tried for years to find some way to identify this thing I was feeling. Childhood domestic violence seemed so simple but was something I couldn't think of. Once I was able to understand it, I was able to overcome it." The research suggests that change is driven by awareness, understanding, and sharing. But awareness of CDV is less than 10 percent and no one really talks about it. So how can the 15 million children and 40 million adults in the U.S. impacted by CDV begin to understand and overcome the impact? Sharing your story is critical to helping others who grew up with childhood domestic violence understand it is "a thing," realize they're not alone, and begin to transform their lives. Even by simply using the term "CDV," you are making a difference. And the more organizations and individuals who use the name, the easier it becomes for children and adolescents to identify their experience, use the right words to speak about it, and find information and help -- through a supportive adult or even just a search engine.